You are here: Home » MEDIA » Comics » Daughters Of The Dragon: Samurai Bullets TPB by Jimmy Palmiotti, Justin Gray and Khari Evans (graphic novel review). Daughters Of The Dragon: Samurai Bullets TPB by Jimmy Palmiotti, Justin Gray and Khari Evans (graphic novel review). 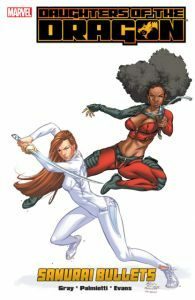 I’ve known Colleen Wing and Misty Knight from the early days in the black and white Marvel’s ‘Deadly Hands Of Kung Fu’ magazine and their first formation of their Nightwing Restorations’. In today’s century, they are also employed as bondswomen, usually for super-villains and who they run after if they jump bail. All of which they seem capable of taking down as a pair if they don’t arrive in court. Mind you, considering how much bail money has to be put up, you do have to wonder why the judges don’t make it impossible amounts to meet. In many respects, this is one element of the story I have a big problem with. Granted most of the super-villains here are classed as C-level, some like the Rhino have opposed Spider-Man. All Colleen Wing has going for her is superior martial arts and sword training. Misty Knight has a bionic arm, upgraded in this graphic novel, but has normal physical strength. If anything, I would think even the villains they face could outmatch them. It wouldn’t take more than a few lucky blows to stop them. Do they look at each super-villain and select on the basis that they can beat them? At the moment, they are in the process of tracking down Freeze-Burn for not attending court, only to find him murdered. It seems he, Whirlwind, 8-Ball and Humbug stole some property off Celia Ricadonna and she wants it back. Their attempts to keep the rest of them alive doesn’t go too well. More so when the property turns out to be a computer chip, created by the Thinker, is capable of crashing all the world’s defence systems. No wonder the Thinker is mad to consider passing that chip on to someone else. The people at the auction should raise a few eyebrows. I mean, would members of AIM hide who they belong to under their yellow postbox helmets which cuts their viewing although I wouldn’t be surprised that they have some means to see whose behind them. There’s a lot more going on than that but so much could be deemed spoiler. There’s a lot of humour and touchstones for things you know about the Marvel Universe. Even more surprising is why aren’t some of the major leaguers or even SHIELD getting wind of the auction. This is a very important computer chip after all. The art by Khari Evans is actually very good although could do with a few more wide shots. If I’m to focus on detail, considering that Colleen Wing is oriental, I wish some thought had been given to the epicanthal fold eyelid and given her shorter hair. Considering the opposition she faces, all someone has to do is grab her hair and she’d have a very much broken neck. I haven’t strayed much into the comicbook version of the Marvel Universe for a few years and this mini-series was originally released in 2006 so I still haven’t really. Reading this graphic novel though, I can see why they’re being so many demands for a film or TV series. Always pays to have Tony Stark in your corner, especially when you need a new bionic arm. « Wonder Park (2019) [a film review by Frank Ochieng].